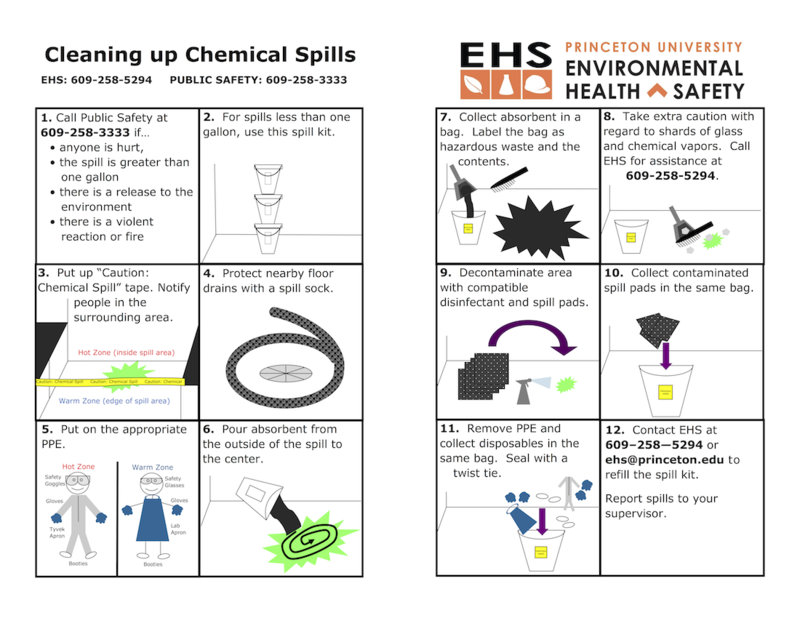 All spill kits come with a Chemical Spill Response Protocol visual guide. Click on the image below to view the guide, or download as a PDF here. If there is a fire or medical attention is needed, contact Public Safety at 609-258-3333. Attend to any people who may be contaminated. Contaminated clothing must be removed immediately and the skin flushed with water for no less than fifteen minutes. Clothing must be laundered before reuse. See First Aid for Chemical Exposures for more information. Consider the need for respiratory protection. The use of a respirator or self-contained breathing apparatus requires specialized training and medical surveillance. Never enter a contaminated atmosphere without protection or use a respirator without training. If respiratory protection is needed and no trained personnel are available, call EHS at x8-5294 or Public Safety at 911. If respiratory protection is used, be sure there is another person outside the spill area in communication, in case of an emergency. If no one is available, contact Public Safety. Using the chart below, determine the extent and type of spill. If the spill is large, if there has been a release to the environment or if there is no one knowledgeable about spill clean-up available, contact EHS at 609-258-5294 from 8:30am-4:30pm. Outside those hours, contact Public Safety at 609-258-3333 and ask for EHS assistance. Contain and clean-up the spill according to the table above. Loose spill control materials should be distributed over the entire spill area, working from the outside, circling to the inside. This reduces the chance of splash or spread of the spilled chemical. Bulk absorbents and many spill pillows do not work with hydrofluoric acid. POWERSORB® (by 3M) products and their equivalent will handle hydrofluoric acid. Specialized hydrofluoric acid kits also are available for purchase from lab safety suppliers. Many neutralizers for acids or bases have a color change indicator to show when the spill is neutralized. Acquire sufficient quantities and types of appropriate spill control materials to contain any spills that can be reasonably anticipated. The need for equipment to disperse, collect and contain spill control materials (e.g., brushes, scoops, sealable containers, etc.) should also be reviewed. See Recommended Spill Control Materials Inventory for more details. EHS maintains EHS chemical spill control kits that can be used if no other materials are available. After use, please call EHS at 258-5294 to restock. Acquire recommended personal protective equipment and training in its proper use. *For example, if an air purifying respirator or self-contained breathing apparatus are needed, personnel must be enrolled in the Respiratory Protection Program and attend annual training and fit-testing. Discuss the spill response plans with all employees in the area. EHS offers training for employees who work directly with chemicals (see Chemical Spills and Waste Procedures) and who are expected to respond outside their work area to assist with spill cleanup (see Chemical Emergency Response (HAZWOPER) First Responder - Operations Level Training). Contact Steve Elwood at 258-6271to schedule a session for your area. Spill kits are located in major hallways, stairwells and near elevators. Note: For spills greater than 4 liters, call Public Safety at 609-258-3333. Each Chemical Spill Kit contains one Toolbox/ PPE Spill Kit and two Universal Spill Absorbent Kits.